This latest denier effort is a letter from Richard Lindzen along with a petition signed by 300 plus people. 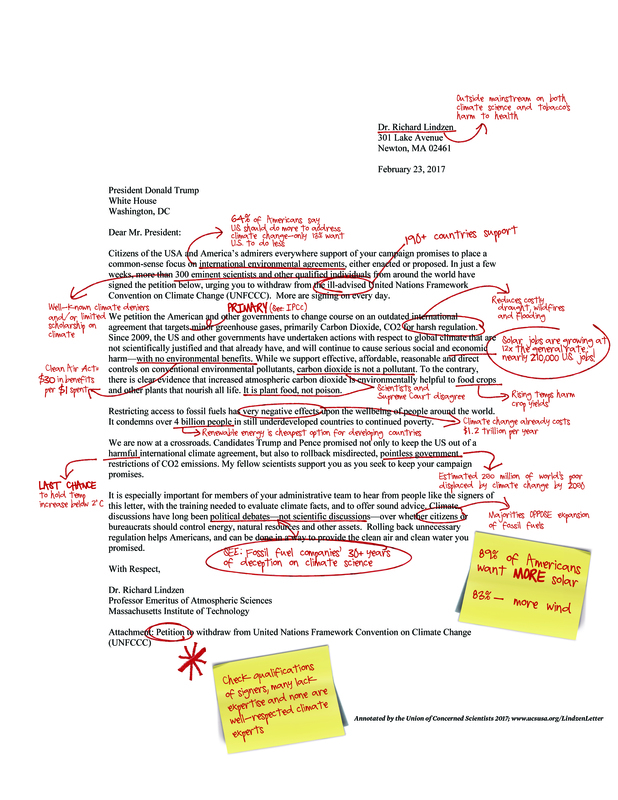 John Abraham, a climate and energy researcher at University of St. Thomas (MN), has already reviewed the petition signers and found many to have limited to irrelevant credentials related to the causes and consequences of a disrupted climate. Who is Richard Lindzen? He is a scientist at MIT who is well outside the mainstream consensus on both climate science and tobacco’s harm to human health. Where do American’s stand on international (and national) climate action? 64% say the U.S. should “do more” or “do much more” to address climate change, only 13% say the U.S. should do less. How important is carbon dioxide in climate change? There is a strong scientific consensus that CO2 emissions from burning fossil fuels and other human activities is the leading driver of climate change. What’s more costly, emission reductions or climate change? A study commissioned by 20 governments by more than 50 scientists, economists, and other experts found that climate change already costs the global economy more than $1.2 trillion a year from climate induced drought, heat waves, wildfires, extreme weather, and more. What is the impact of policies that clean up our emissions and promote clean energy? The clean energy economy is a job growth engine. Solar industry jobs are adding at a rate nearly 17 times faster than the overall economy. Solar employs more people—260,000 in 2016—in the US than natural gas, coal, wind, and nuclear. What are the benefits of the Clean Air Act (the mechanism used to regulate carbon pollution)? We get $30 back for every $1 spent—an astonishing return on investment. From 1990-2020, the Clean Air Act is expected to prevent more than 230,000 early deaths. Is carbon dioxide a pollutant? In 2006, a Supreme Court decision gave the Environmental Protection Agency (EPA) authority to regulate carbon dioxide under the US Clean Air Act, which includes provision to list pollutants that endanger public health and welfare. Based on a preponderance of evidence, in 2009 the EPA issued the Endangerment Finding to regulate carbon dioxide and other heat-trapping gases. What does excessive carbon pollution mean for farming? If farming communities have the resources to apply resilience principles and consider the risks for projected climate conditions to minimize harm and maximize options in an equitable way, some farming activities could be adapted to a changing climate. If, however, current agricultural activities in parts of the world were to remain similar, the following risks could occur. Rising temperatures from atmospheric CO2 have outstripped benefits to cause net reduction in yield with some major food crops in many parts of the world. Increasing temperatures in US growing regions would drop yields for two major food crops—at least a third under a lower emissions scenario and in the worst case 80 percent under a highest emissions scenario. Farmers face greater costs fighting pests that can thrive under warmer temperatures on their land than historically was typical. Not to mention the shifting timing and severity of weather, often providing too much water when not needed or too little water when needed most and wreaking havoc on seasonal farming activities. How will the world’s poor fare under climate change? It is true that many in developing nations need access to electricity. Renewable energy is one promising low cost option to help provide many communities with affordable clean energy and advance progress toward the UN Sustainable Development Goals. That is doubly important, as it is essential that bringing energy to the world’s poorest people be done in a way that doesn’t exacerbate climate harm. Poor people are often hurt first and worst by climate change. In fact, it is estimated that 250 million of the world’s people, mostly low-income people, will be displaced by climate change by 2050. Why is climate politicized? See 30-plus years of deception by fossil fuel companies. Thousands of scientists with expertise in climate are ready to represent the weight of the evidence presented on city, state, national, and international levels. What types of energy do Americans want? Expanded solar power (89%), expanded wind power (83%), while majorities oppose expanding oil, coal and natural gas. 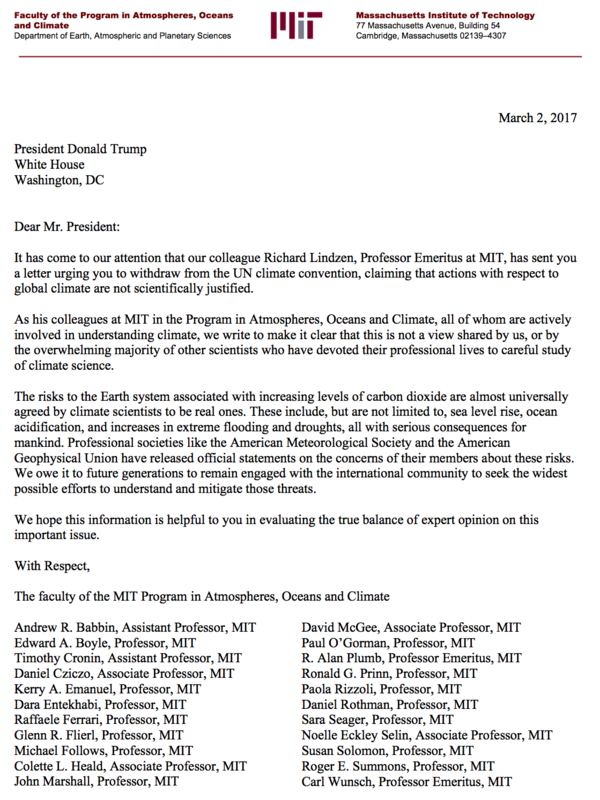 Here’s the full letter from Richard Lindzen to President Trump, annotated by the Union of Concerned Scientists. 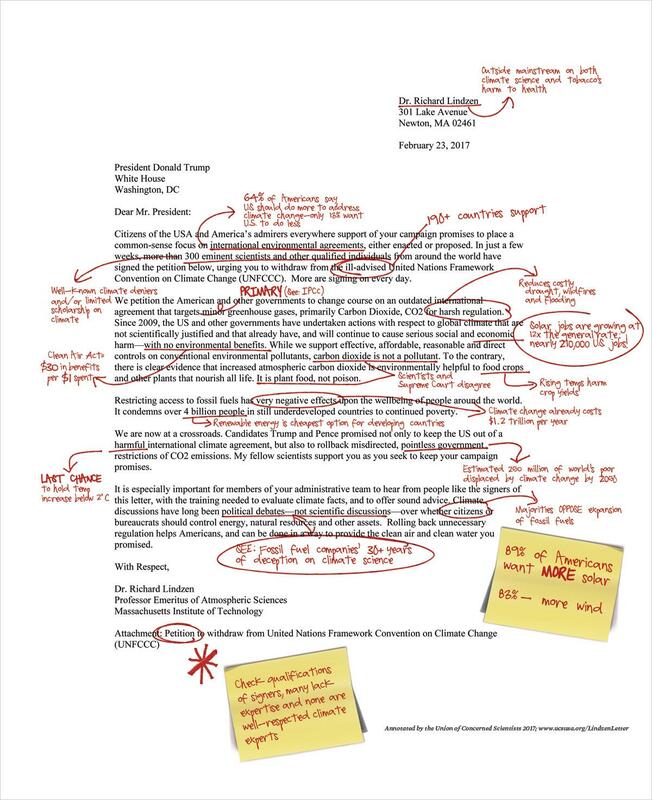 Download a high-resolution version of this letter. Myers' nomination is now approaching a vote on the Senate floor to confirm him as NOAA administrator. NOAA and the nation don’t deserve an unqualified and conflicted nominee that turns a blind eye to sexual harassment.